PUMA have highlighted the intricate details and technology behind their latest release, which will also be worn by international stars such as Atletico Madrid striker Antoinne Griezmann and Borussia Dortmun midfielder Marco Reus. 'FUTURE is the first football boot with a truly customizable fit. NETFIT technology allows the wearer to lace their boots any way they want in order to fit perfectly, no matter the foot shape or lock-down need,' read the PUMA statement. 'The FUTURE utilizes PUMA's adaptable NETFIT technology initially designed for running and takes it to New Levels by applying it to the upper creating a boot that is aggressive in its aesthetic, unique in its appearance, and in its lacing system a purely individual fit experience. 'The lacing system is there to be experimented with, to adapt to your fit specifications, whether wide or narrow footed, and give you the ultimate lock-down. With its infinite customization options, NETFIT allows for the ultimate on pitch expression, allowing players to truly stand out with their own unique lacing designs. 'To further enhance the overall fit and feel of the boots the NETFIT upper has been fused to the evoKNIT sock and striking zones to create one form-fitting textile base layer, bringing the wearer a snug-fit whilst making sure the foot is closer to the ball on impact for that perfect touch. 'The evoKNIT sock has been designed to be non-restrictive and allow for limitless agility thanks to its specifically placed cuts, whilst the material itself offers supreme support and comfort throughout the game. 'The FUTURE also introduces the brand new RAPIDAGILITY outsole, made of super lightweight and reactive Pebax, and contains a mix of conical and bladed studs that are designed to bring the best results in traction and stability. Perfect for those quick turns of pace, and moments of quick-footed brilliance that leave your opponents in a twisted heap. 'The Q1 FUTURE 18.1 comes in a disruptive yellow and black graphic execution that echo's the explosion of energy felt when those outrageous moments of brilliance come off, sparking off flares in the stands and scenes in the streets. 'The release of the FUTURE 18.1 release is accompanied by a campaign film created by the 2017 UK Music Video Award winning director Ryan Staake and featuring Antoine Griezmann with music provided by the king of Afrotrap 'MHD' in the form of the track 'AFRO TRAP Part.7 (La Puissance)'. 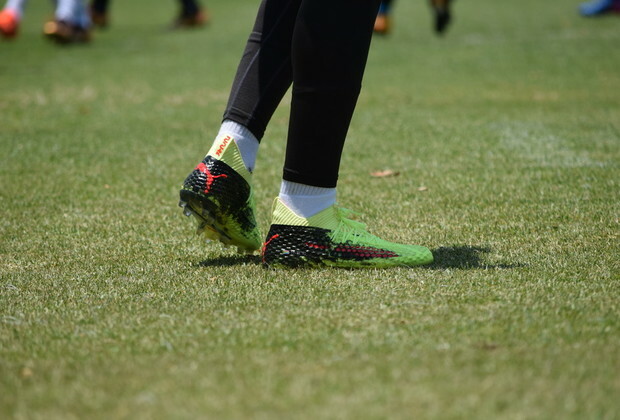 Zwane, Lebese and Tau were all spotted in their new 'tools' during Mamemodi Sundowns' training session last Friday, ahead of their Absa Premiership clash against Orlando Pirates over the weekend. The FUTURE 18.1 NETFIT FG Football boot is available from 1 February at PUMA Stores and participating retailers nationwide for R3 499. OFFER: Buy the boots and receive an evoKNIT shirt, evoKNIT shorts, socks, three-quarter baselayer and backpack – worth R4299 – while stocks last.